*Includes all Season Pass perks listed at https://splashdownbeach.com/season-pass-perks/ Season pass price does not include tax. Season passes may be purchased for adults and children age 3 and older. 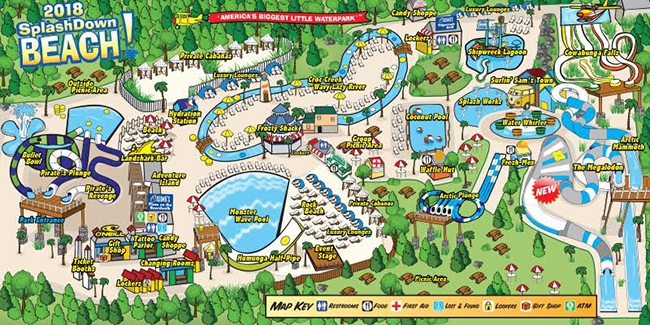 For children age 2 and under, a reusable swim diaper must be purchased at SplashDown Beach. Once you own one, bring it back and child enters for free. Season passes are non-refundable and non-transferable and are only valid during the season they were purchased unless otherwise specified. A Season Pass allows entry of one person into the Park. Avoid the lines! Save $5 by buying online. Buy tickets online. Get your Season Passes! Pays for itself in only 3 visits! Buy Season Passes online. We participate in the ELLIS & Associates International Lifeguard Training Program. Click here for more information. ©SplashDown Beach. All Rights Reserved.